The Chalfont St Peter Fun Night is always a wonderful evening to get you into the spirit of Christmas. This year’s event took place on the 7th of December. Once again, we had our traditional stall, giving away “the best” hot chocolate according to some of our visitors. There were plenty of food and drink stalls along Market Street. We were spoilt for choice when it came to buying presents for Christmas. Shops stayed open for late night shoppers as well, giving them a chance to stay warm while ticking off some of the presents from their Christmas lists. It was wonderful to see so many familiar faces including many clients we have been working with for many years. It was also a great opportunity to meet and chat with many people from the village including excited children rushing to the fun rides. There was a beautiful atmosphere in the village. We enjoyed the carol singing and dancing elves, shopping at the local business and community group stalls, met Father Christmas and joined in for the Christmas Zumba. Our Director John Peskett reported from our stall at Chalfont St Peter Fun Night – yes, that is him on the left! “As always, this year’s Christmas Fun Night was another amazingly well-supported and enjoyable night. Thankfully, despite the near monsoon conditions in the morning, the ‘anti-rain dance’ we all did appeared to do the trick and the weather was ultimately kind and the rain held off. From our perspective, it is always a pleasure to interact and engage with the local residents and we are proud to support local events such as this and the Feast of St Peter, which bring the community together whilst also raising money for such worthwhile causes. We look forward to seeing you at the Feast of St Peter in June 2019. 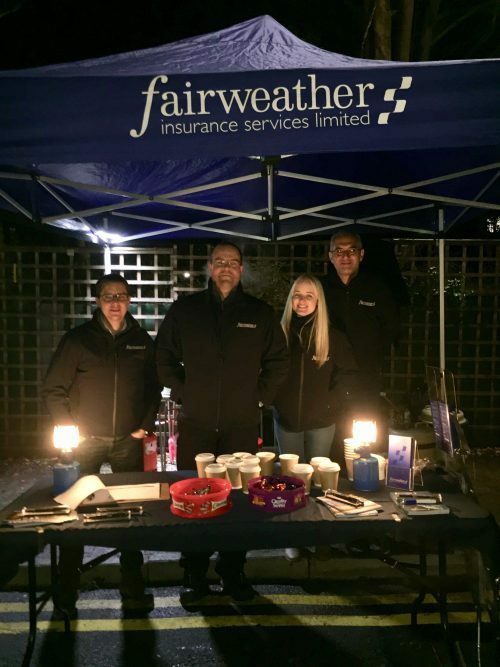 For more information on the Fun Night please visit the Fairweather Insurance or Feast of St Peter Facebook Pages. Like us on Facebook to find out more about how we support local activities, the competitions we will be having in 2019 and our Insurance Tips.